We live in a world today where automation seems to be the way to go. It would be a nice idea if you can take this automation to the aquarium lighting too. Well, it seems to have happened already. This is thanks to the use of the aquarium light timers out there on the market. If you have not used one before, no worries as we have you covered. 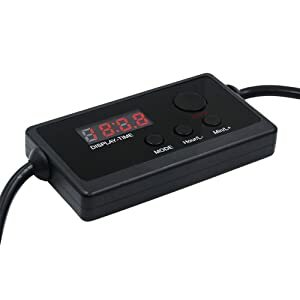 We get to present you with the best aquarium light timers that you can buy today. Check them out below to make an informed decision. How to Set Aquarium Light Timer? 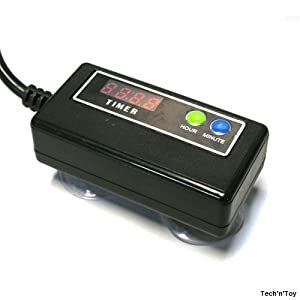 This is one of the simplest aquarium timers that you can get today for better use of the aquarium light. The manufacturer made it come with one setting and that should be the custom setting. This type of setting allows for you to set up the time quite easily. Anyone who has not used a timer before will still have an easy time setting it up. You have to keep in mind that each black tab represents 15-minute increment. You should now be in a position to set up the time just as you want. When it comes to setting the time, you have to keep in mind that the clock in the 24-hour system. Just make sure that it always reads the correct current time so that the timer can go off accurately. In the event you have any troubles, you can always refer to the manual as given by the manufacturer. You should have an easy time using it always. The timer features a 3 prong grounded outlet. This kind of connection is important to eliminate scenarios such as electrocution. Due to its size, you should find it easily occupying 2 outlet spaces. For some people, this might be an inconvenience as they cannot use the other outlet. Nevertheless, it is worth using it. 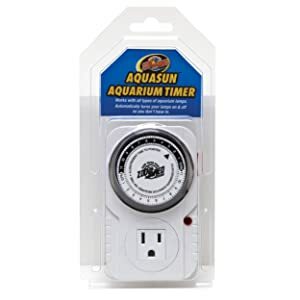 Make sure that there is an outlet close to the aquarium so that you can set up the timer easily. Also, it is because the timer does not plug into an extension cord. It comes with a manual override function. This can be used when you have to turn on and off the light during the programmed period. The LED lamp indicator gets brighter when the light is turned on. When it comes to this model, it will change the way your aquarium lights and for the better too. The model will simulate a gradual sunrise and sunset for the aquarium inhabitants with ease. This can even help eliminate stress as compared to models that just start working with no gradual lighting. It is fully programmable. This means that you can set it to work just as you want. It will turn on and off the light, making it suitable for various aquarium lighting conditions. As for the application, you should find this model being great for both the freshwater and marine aquariums. You can be sure that it will deliver on the performance always. You should find that it is also easy to use. You can easily acclimate it to the various animals in the aquarium with ease. The use of the slow acclimation process will help in reducing the stress that is often caused by the sudden change in light intensity. In the end, you should now have a rhythmic day and night light cycle that the animals are used to. As for the installation part, you will always find it being easy. The process is clearly explained in the manual so that you can have an easy time setting it up. Nevertheless, it involves plunging the light fixture to the power source and then connect to the time. With both circuits on, you can now go ahead to program the timer. You can still opt for the manual override so that you can turn on or off the light whenever you feel like. This is another top performance timer you can get today. It comes from a top brand so we can expect it to deliver on performance always. You can be sure that it will always help you achieve the best timing options for your aquarium light. From the overall design, you get the idea that the model is simple to set up and use. It is not like one of those timers you get lost along the way of using it. This one is simple. You get just two buttons for setting it. As for the setup, you can change the hour up to the minute you want the time to turn on or off the light. You can always refer to the manual in the event you find it hard to use the model. You may find that this might not always be necessary as the process is straightforward. Its small footprint should not be trouble for anyone. You can always have an easy time setting it up anywhere and wire it to start working. Well, you should find it being a convenient way of controlling your aquarium light. It is not always that you will be around to make such changes. It works with a wide range of fixtures. They include the Beamswork and EVO Quad light fixtures. With such versatility, there is no doubt you will get to see more people picking this type of model. There is an exception of the Beamswork ET series. You might have to pick a different timer for the series. You will also like the fact that the model is affordable. Yes, you do not have to spend a lot of money to access the performance features that this timer has to offer. Nicrew is a top brand, so we do not expect to have much of a problem when it comes to using this type of timer. It comes with a number of top features that will easily make it one of the best to use right now. 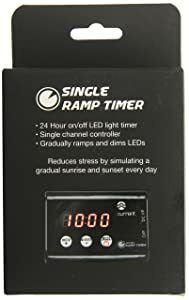 There is no doubt having a timer will be great for anyone looking to automate the aquarium lighting. You will love the fact that it can simulate the sunrise and sunset. This is an important feature when it comes to the health of the fish. The gradual introduction of lighting helps to reduce the stress on the fish. This is better as compared to when the light shines bright all of a sudden. Even for the humans, we tend to get disoriented when this happens. You will get it comes with 24-hour digital timer that you can easily set. As much as there is a manual for you to use, we doubt if you can find a use for it. This is because the model can easily be programmed just as you want. Since it comes with 8 separate timing programs, there is no doubt it will be versatile for most users. They will always find it easy to setting up the timer to work just as they want. It is still possible for you to do a manual override. This should help you change the brightness just as you like even when the unit is already programmed. Setting up with your light fixture is a breeze. You should not have any problem getting it done always. Setting up the aquarium light timer should be relatively easy. As much as the process might differ from model to model, you will never have trouble getting it done. Here is the typical process you can follow. Connect it to the aquarium light so that you can program the lighting. Depending on what is in the aquarium, you can decide at which time the light turns on and off. With everything done, you should the timer do its work of automating the lighting conditions. When it comes to aquarium lighting, you always want to have the best product. Well, that is what you get when also have the best light timer too. From the models reviewed above, you should have an easy time making up your mind right now. You can always end up choosing the best timer that will work with your light fixture. Does anyone know where I can get one of these light timers? 36W 6400 K compact fluorescent lamp Lighting system equipped with a timer. I live in Manchester England. Thanks.